University of Illinois Press, 9780252076091, 432pp. 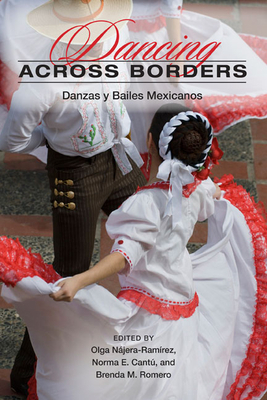 This book explores Mexican popular and traditional dance practices on both sides of the U.S.-Mexico border, addressing questions of authenticity, aesthetics, identity, interpretation, and research methodologies in dance performance. Contributors include not only noted scholars from a variety of disciplines but also several dance practitioners who reflect on their engagement with dance and reveal subtexts of dance culture. Contributors are Norma E. Cantú, Susan Cashion, María Teresa Ceseña, Xóchitl C. Chávez, Adriana Cruz Manjarrez, Renée de la Torre Castellanos, Peter J. García, Rudy F. García, Chris Goertzen, Martha González, Elisa Diana Huerta, Sydney Hutchinson, Marie "Keta" Miranda, Olga Nájera-Ramírez, Shakina Nayfack, Russell Rodríguez, Brenda M. Romero, Nancy Lee Chalfa Ruyter, José Sánchez Jiménez, and Alberto Zárate Rosales. Olga Najera-Ramirez is a professor of anthropology at the University of California, Santa Cruz. Norma E. Cantu is a professor of English at the University of Texas, San Antonio. Brenda M. Romero is an associate professor of ethnomusicology at the University of Colorado, Boulder.